Noah Cyrus and Lil Xan‘s split might have been one of the messiest breakups of 2018. In case you forgot, let’s recap a bit. The two called it quits in September after a month of dating. But things got really nasty after the breakup when they started accusing each other of cheating via their social media accounts. At one point, the rapper even implied that the whole relationship was faked for PR purposes, which Noah was quick to deny. It got pretty ugly and the two went back and forth for a while, constantly calling each other out and shading each other any chance they could it seems. But now, it looks like Noah may finally be moving on from the rapper as she was spotted out and about in Los Angeles with a mystery man on Nov. 11, looking happier than ever. Noah and her mystery guy could not be cuter — scroll through our gallery to see the pics! Noah and her mystery man were total goals in matching, all-black outfits. She kept it casual for the outing, wearing sweatpants and a super cute crop top that showed off her midriff, while her mystery man on the other hand, rocked black jeans and a t-shirt. 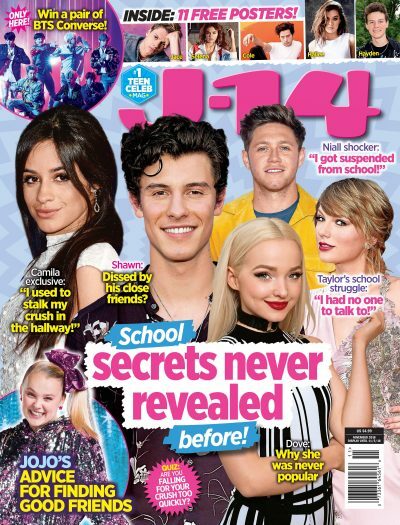 As J-14 readers know, Noah and Lil Xan made their debut as a couple at the 2018 MTV Video Music Awards back in August, but things turned really nasty when the rapper accused the “Again” singer of cheating on him via his Instagram Story. Noah denied the accusations and later accused the 22-year-old of cheating on her too. Although it was definitely messy, it seems like Noah is doing okay now as she looked happier than ever alongside this mystery man. Whether it’s this guy or someone else, we are definitely rooting for the singer to find love again soon.